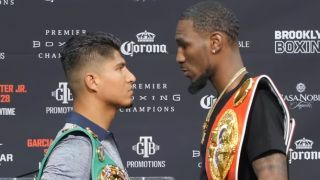 Lightweight World Champions Mikey Garcia and Robert Easter Jr. are set to meet in a 135-pound title unification fight in Los Angles. Who will take the two titles for their own? You can find out by watching the potentially epic battle using a live stream of the boxing from anywhere you are. Garcia vs Easter Jr - where and when? The Mikey Garcia vs Robert Easter Jr. fight takes place on Saturday July 28 at the Staples Center in Los Angeles. It’s set for a 10pm start Eastern Time – that's 7pm Pacific and 3am BST in the early hours of Sunday for UK viewers. This is it, the fight to determine who is the best lightweight boxer in the world. Mikey Garcia brings his WBC title while Robert Easter Jr. has his IBF belt backing him. Garcia won his title in 2017 by knockout when he beat Dejan Zlatičanin in the third. Moving weight up to the 140-pounds category, he has now won a total of four world titles in four different weight categories. Easter Jr. nabbed his vacant belt from Richard Commey in 2016 and has defended it three times, winning each by beating Luis Cruz, Denis Shafikov and Javier Fortuna. Garcia stands with a record of 38-0, 30 KOs while Easter Jr. is 21-0, 14 KOs. Is Easter going to finally stand tall as the world's best fighter in his category? Will Garcia's weight changes help or hinder him? This fight will tell all. Even if there isn't a broadcast in your country, with our advice you could try using a VPN to live stream the Garcia vs Easter fight live - there's even a way to watch for free. Those wanting to catch Garcia vs Easter Jr. in the US can do so my tuning into Showtime Sports. If you don't subscribe already, there's a seven day FREE trial but you'll need a US registered payment card to be able to use that. After the seven days it'll cost $10.99 a month, so be sure to cancel it if you don't want to keep it going. Showtime has a variety of different streaming providers including an app for Android and iOS, but if you're travelling you may want to use a VPN to ensure you're able to stream it from anywhere. Showtime's coverage is at 10pm Eastern and 7pm Pacific. Sorry UK fight fans, it doesn't look like either Sky Sports or BT Sport have decided to pick up the Garcia vs Easter Jr bout. The only way we can think of watching is by grabbing a VPN and trying to get hold of coverage in another country. Unfortunately Aus fight fans, it doesn't look like either a network has decided to pick up the Garcia vs Easter Jr bout. One way you may be able to watch is to get a VPN and try to find coverage in another country.